Our audio equipment is "professional live sound grade". It includes Mackie mixing boards, Yamaha and Behringer speakers, Nady and Yamaha amplifiers, Shure and Peavey microphones. We also use the very best microphone/speaker cables and SKG equipment shells to protect our equipment. We use a Numark dual disc CDG player. We are in the process of running off of "Ultra Mixer" DJ software. We have a backup computer system for redundancy. 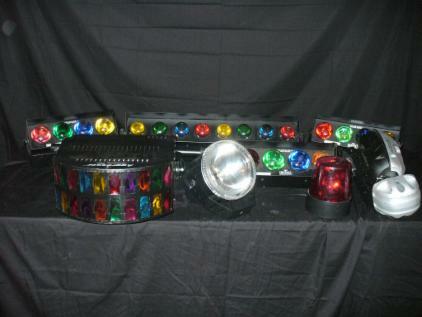 Our lighting equipment includes American DJ and Chauvet. We respect copyright laws. Many DJ/KJ's steal their music from the internet, buy disc drives preloaded with DJ or Karaoke music for pennies on the dollar, borrow CD's from their friends or other DJ's, buy copied CD's, or use illegally downloaded or copied versions. 99% of the time this violates copyright laws. Hiring DJ/KJ's with illegal music may unknowingly put private clubs, bars and restaurants, and other public venues at possible copyright violation risk. Our DJ music and karaoke selections are "BOOTLEG FREE". We purchase our DJ music from "Soundcheck Records", now in Jim Thorpe and online. 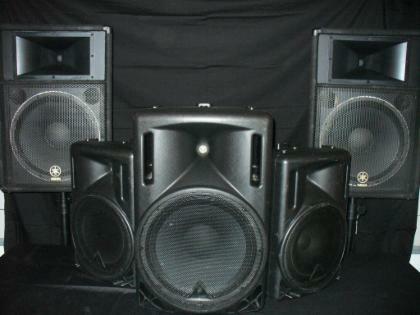 Our karaoke music is purchased from online distributors, the Doowop Shop and Karaoke Warehouse. When hiring a DJ or KJ, ask them where they get their music. Those that use illegal music are stealing from the music and karaoke industries. We have a great variety of special effects lighting including Veritigo's, colored strobes, Agressors, LED's, Oceana's, floor splash lighting, and white strobes. Party props (to be returned after event) include a great variety of sunglasses, wigs, hats, noisemakers, maracas, blow up guitars and saxes, and lots of other stuff to enhance the fun at your event.